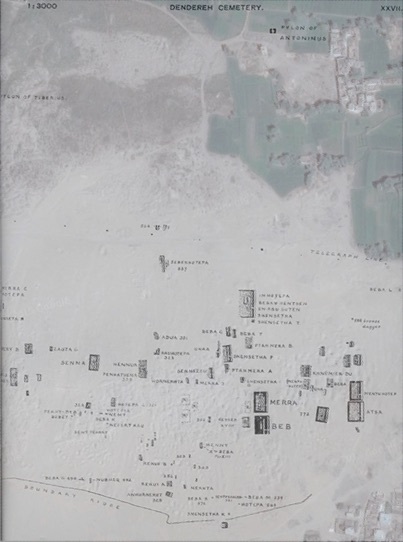 The earliest remains at the site are Early Dynastic tombs, but the Old Kingdom and 1st Intermediate Period tombs of the elite are notable because the area was autonomous. On the west end of the site are brick-vaulted catacombs of the Late Period with animal burials. The main temple complex is elaborate, with large foundations blocks likely to have been from an early structure, which this complex replaced in the Ptolemaic Period. Additional temples include a sanctuary dedicated to Isis and decorated during the reign of Augustus and a temple dedicated to Horus of Edfu. Other blocks inscribed with the names of Pepy I and Thutmose III have been reused in the structure. East of the temple are the remains of the town. Cauville, S. 1998. Dendara I: traduction. Orientalia Lovaniensia Analecta 81. Leuven: Peeters. Cauville, Sylvie 1995. Le temple de Dendara: guide archéologique, 2nd ed. Bibliothèque générale 12. Le Caire: Institut Français d'Archéologie Orientale. Petrie, W. M. Flinders 1900. Dendereh: 1898. Memoir of the Egypt Exploration Fund 17. London: Egypt Exploration Fund. Petrie, W. M. Flinders 1904. Gurob and Dendereh. Zeitschrift für ägyptische Sprache und Altertumskunde 41, 93. Zignani, Pierre 2010. Le temple d'Hathor à Dendara: relevés et étude architecturale, 2 vols. Bibliothèque d'étude 146. Le Caire: Institut français d'archéologie orientale.